Many tumorigenic stimuli trigger a protective cellular response known as cellular senescence, a stable cell cycle arrest characterized by an active metabolism, secretion of immunomodulatory factors and activation of tumor suppressor pathways. The senescence state depends on the continuous and aberrant activation of signalling pathways. Senescent cells will remain non-dividing as long as this aberrant signalling is maintained. However, if these signals are attenuated, senescent cells can escape form their dormant condition and dangerously progress into tumor formation. Here we compare the transcriptome of oncogenic Ras–induced senescent cells with that of cells that escaped from senescence after attenuation of the ERK/MAP kinase signaling pathway. We found that cells that escaped from senescence express genes associated to genetic instability and display a highly aberrant karyotype. These cells also express genes commonly altered in the cancer transcriptome of different tissues supporting the idea of a common gene expression program that governs cancer cells. Bioinformatic analyses identified the transcription factors most likely regulating the gene expression programs of senescent cells and cells that escape from senescence. We propose a model of carcinogenesis where cells that escape from senescence provide a heterogeneous population of genetically unstable cells that can progress into malignant tumors. Muchos estímulos tumorigénicos desencadenan una respuesta celular protectora conocida como senescencia celular, la cual es una detención estable del ciclo celular caracterizada por un metabolismo activo, la secreción de factores inmunomoduladores y la activación de vías de supresión de tumores. El estado de senescencia depende de la activación continua y aberrante de las rutas de señalización. Las células senescentes permanecerán sin dividirse el tiempo que se mantiene esta señalización aberrante. Sin embargo, si se atenúan estas señales, las células senescentes pueden escapar de su condición inactiva y peligrosamente progresar a la formación de tumores. Aquí comparamos el transcriptoma de las células senescentes oncogénicas inducidas por Ras, con el de las células que escaparon de la senescencia después de la atenuación de la vía de señalización de la quinasa / ERK MAP. Encontramos que las células que escaparon de la senescencia expresan los genes asociados a la inestabilidad genética y muestran un cariotipo altamente aberrante. Estas células también expresan genes comúnmente alterados en el transcriptoma de diferentes tejidos cancerígenos que apoyan la idea de un programa de expresión génica común que regula las células cancerosas. Los análisis bioinformáticos identificaron los factores de transcripción más probable que regulan los programas de expresión génica de células senescentes y células que se escapan de la senescencia. Nosotros proponemos un modelo de carcinogénesis donde las células que se escapan de la senescencia proporcionan una población heterogénea de células genéticamente inestables que pueden progresar en tumores malignos. Palabras clave: senescencia, supresor de tumores, inmunidad. Mammary epithelial cells can spontaneously escape from senescence 13 and this has been linked to a downregulation of the ERK pathway. 11 In a model of Ras-induced senescence in human fibroblasts we previously reported that downregulation of ERK allows to bypass senescence and in combination with expression of telomerase leads to malignant transformation. 11 Several studies have concluded that Ras-signaling through the ERK kinases is important for transformation and tumor progression. 14 However, in multiple tissues the most malignant tumors have very low levels of activated ERK, thereby indicating a more complex relationship between these kinases and cancer. 14 To get insights into the process of malignant transformation in cells that escape from senescence we report here a transcriptome analysis of cancer cells obtained after bypassing senescence by reducing ERK activity in comparison with its premalignant senescent precursors that have very high levels of activated ERK. Cells, experimental cell biology, protein analysis and cytogenetics. Normal human diploid fibroblasts IMR90 were obtained from American Type Culture Collection (ATCC, Manassas, VA). Cells were cultured in Dulbecco’s modified Eagle medium (DMEM; Wisent, Montréal, QC) supplemented with 10% fetal bovine serum (FBS; Wisent) and 1% penicillin G/streptomycin sulfate (Wisent). Retroviral gene transfer, senescence biomarkers, immunoblotting and RNA purification were done as described previously. 11 Karyotypic analysis were performed by the cytogenetics platform of the Quebec Leukemia Cell Bank (http://bclq.org/). Unexpectedly, senescent cells expressed a series of keratinization genes clustered in chromosome 1q21 (Figure 1D). They include multiple late cornified envelope genes and several small proline-rich proteins (Figure 1E). These proteins form a cornified envelope under the plasma membrane of differentiated keratinocytes and contribute to the barrier function of the skin. 20 Their role in senescence remains to be investigated but the fact that p53 regulates their expression suggest that they may be part of the overall tumor suppression functions of senescence.21 Intriguingly, other genes located at 1q21 were also upregulated in senescent cells and they include CTSS, TUFT1, SMCP, S100A8, IVL, HEPHL1, CRCT1, C1orf46 and the long non-coding RNA LINC00302. The differential expression of these genes between senescent cells and cells that escape senescence can be easily visualized using the GEO2R program available at the GEO site containing our microarray data. Our GEO accession number is GSE33613 and one example for differential gene expression found with GEO2R is shown for LINC00302 in figure 1F. Figure 1. Changes in global gene expression patterns in human fibroblasts that escape from senescence. (A) Immunoblots for the indicated proteins in IMR90 cells expressing oncogenic Ras (R) or a vector control (V) and either an shRNA control (shCTR) or an shRNA targeting ERK2 (shERK). (B) Senescence-associated b-galactosidase of IMR90 cells expressing the indicated vectors. The percentage and standard deviation of SA-b-Gal positive cells is indicated in each panel. (C and D) Bioinformatics analysis of gene expression data with the platform DAVID. (C) Most significant annotation clusters for genes upregulated in cells that escape from senescence. (D) Most significant annotation clusters for genes downregulated in cells that escape from senescence. (E) Senescent cells express high levels of keratinization genes that cluster at the chromosome locus 1q21. (F) GEO2R allows retrieving microarray data for selected genes. Here the long non-coding RNA LINC00302 is shown as an example. A pathway controlling a particular cellular function is regulated by multiple genes. Small changes in many of those genes can have a strong effect on the final output but are ignored by only considering genes with substantial changes in expression. To circumvent this problem, gene sets has been defined for multiple biological categories. DAVID, the bioinformatics program used above, uses gene sets as defined by the Gene Ontology project. This method ignores genes that may play a role not yet discovered in a biological process and is therefore biased. Gene set enrichment analysis (GSEA) compares microarray data to gene sets defined by previous microarrays studies. It thus determines whether members of a gene set are enriched at the top or the bottom of the gene expression data. 17 GSEA considers all genes in the microarray data without arbitrary cut-off based on fold change or significance. Figure 2. Gene set enrichment analysis (GSEA) of genes highly expressed in senescent cells in comparison with cells that escaped from senescence. (A and C-G) In each panel, the enrichment score (ES) along the data set is shown on the x axis of the graphic. Each vertical bar represents a gene, and genes enriched in either condition are at the right (shERK) or left (shCTR) parts of the graph. The normalized enrichment score (NES), the p-value and the false discovery rate (q-value) are indicated in the insert. 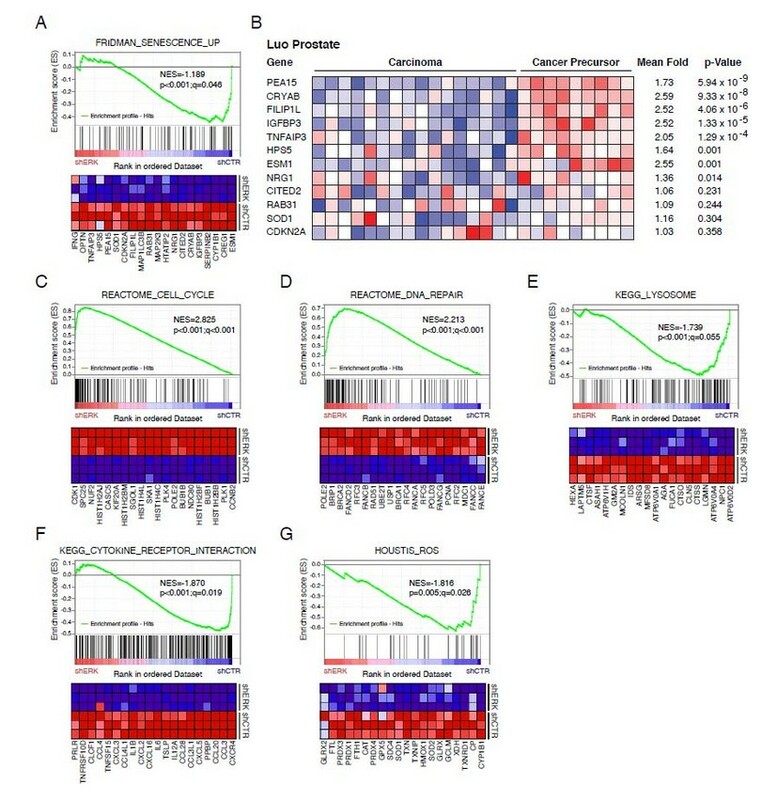 At the bottom, each panel shows a heat map with the top 20 genes that are highly expressed (red) in either the shERK (escape from senescence) condition or the shCTR (senescent) condition.­ (B) Heat maps obtained from Oncomine showing the expression of several genes of the Fridman senescent signature (panel A) in samples from benign and malignant prostate tumors. Figure 3. Gene set enrichment analysis (GSEA) of genes highly expressed in cells that escaped from senescence in comparison with senescent cells. (A-F) As described for Figure 2. Table I. Karyotype of cells that escape from senescence before or after growth in mice. To identify candidate transcription factors that could explain the gene expression changes observed between senescent cells and cells that escaped from senescence, we first used the web-based platform DIRE. 18 The top transcription factors associated to genes upregulated in senescence was JUN (Figure 4A), which is consistent with previous work placing the AP1 (JUN/FOS) transcription factor downstream of the ERK kinases in multiple cellular responses including cell differentiation. 36, 37 The senescence regulators p53 38 and NF-kB 39 were also identified by the algorithm. As expected, transcription factors of the E2F family dominated the list associated to genes upregulated after senescence escape (Figure 4B), indicating that inhibition of the retinoblastoma checkpoint is a key property of growing cells. 12, 27 Interestingly, the transcription factor S8, also known as PRRX2, came second in this list. PRRX2 was recently linked to the TGFb pathway and conferred poor prognosis to breast cancer patients. 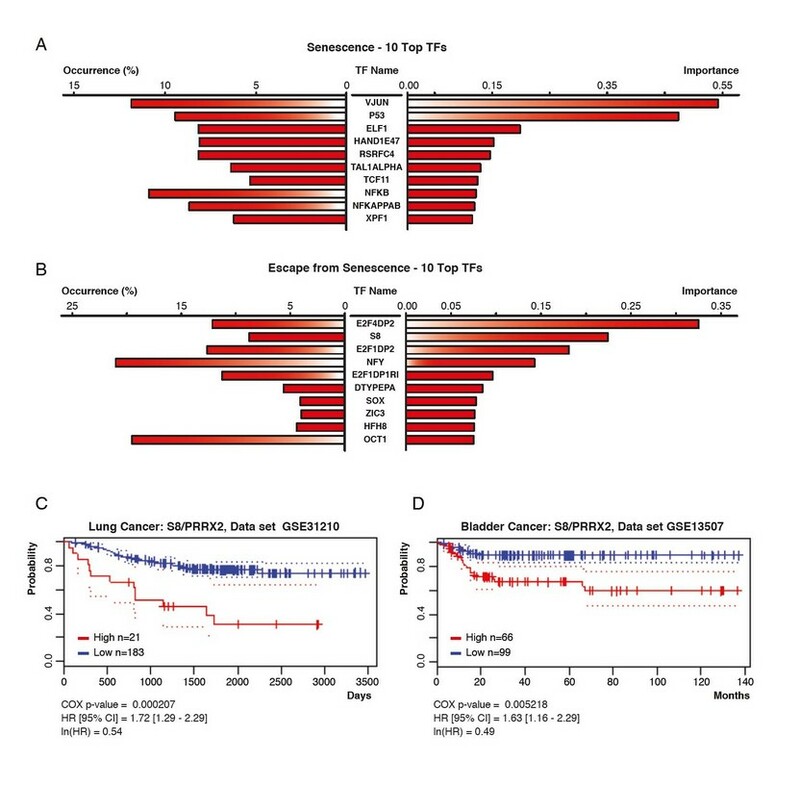 40 Using the PrognoScan webserver we found that PRRX2 also conferred bad prognosis to patients with lung and bladder cancer (Figure 4C and 4D). Figure 4. Transcription factors associated to the transcriptome of senescent cells and cells that escape from senescence according to the algorithm DIRE. (A and B) The percentage of target genes found in the submitted list of transcripts is shown for each potential TF (occurrence). The importance indicates the product of a TF occurrence with is weight in the database. (A) Top transcription factors associated to senescent cells. (B) Top transcription factors associated to cells that escape from senescence. (C and D) Kaplan-Meier and survival analysis using Cox regression which indicates that high expression of PRRX2 is associated to lower survival in lung and bladder cancer. Our gene expression analyses of cells escaping from senescence uncover two apparently contradicting features. First, cells that escape from senescence have multiple genomic abnormalities judging from their highly aberrant karyotype and the expression of genes associated to chromosome instability. The molecular mechanism explaining why cells that escape from senescence exhibit genomic instability remains to be characterized but it could be the consequence of reduced ERK activity. Consistent with this explanation, MEK inhibitors induced genomic instability in glioblastoma cell lines. 41 Second, these cells express a common core of cancer genes previously reported in multiple transcriptomes of cancer cells. 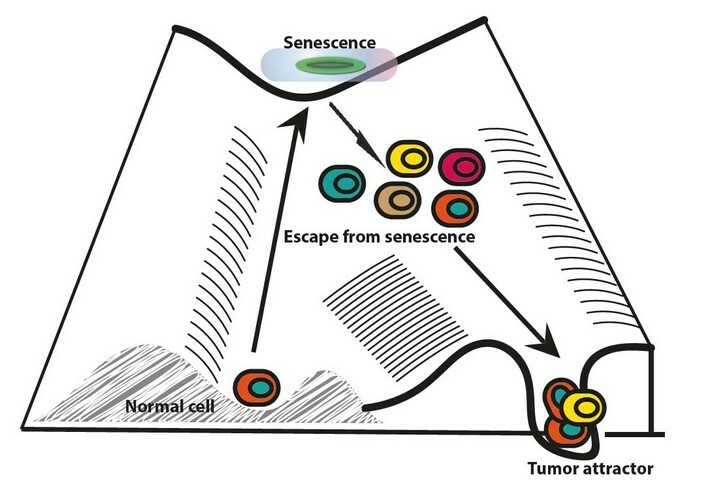 The data can be rationalized into a model of carcinogenesis where the escape from senescence provides an initial cellular heterogeneity upon which selective forces act to shape the final cellular composition of the tumor. However, and despite this heterogeneity, these cells converge towards a gene expression program that acts as a universal “cancer attractor” 42 (Figure 5). This attractor operates in different tissues and in cells growing in Petri dishes suggesting that it is an intrinsic genomic response to signals commonly generated in all those dissimilar conditions. Figure 5. Model of carcinogenesis. Escape from senescence may create a population of unstable cells that can progress into a default proliferative state dubbed the cancer attractor. Therapies that can restore the normal microenvironmental cues might redirect cells that escaped senescence into normal differentiated cells, thus preventing carcinogenesis at its early stages. More than 80 years ago, Waddington speculated that cancer is the response of cells that escape from the influence of a morphogenetic field. 43 The physical nature of this field remains enigmatic but the idea implies that in the absence of their normal environment cells by default will fall into the “cancer attractor” class and evolve into malignant tumors. On the other hand, differentiation states can be considered as attractors as well, suggesting that providing the right environmental cues, cells that escape from senescence might also redifferentiate and avoid tumorigenesis. 1. Bourdeau V, Ferbeyre G. Engaging a senescent response to cure leukemia. Nat Med. 2014;20(2):123-4. 2. Deschenes-Simard X, Lessard F, Gaumont-Leclerc MF, Bardeesy N, Ferbeyre G. Cellular senescence and protein degradation: Breaking down cancer. Cell cycle (Georgetown, Tex. 2014;13(12):1840-58. 3. Chen Z, Trotman LC, Shaffer D, Lin HK, Dotan ZA, Niki M, et al. Crucial role of p53-dependent cellular senescence in suppression of Pten-deficient tumorigenesis. Nature. 2005;436(7051):725-30. 4. Toso A, Revandkar A, Di Mitri D, Guccini I, Proietti M, Sarti M, et al. Enhancing chemotherapy efficacy in Pten-deficient prostate tumors by activating the senescence-associated antitumor immunity. Cell reports. 2014;9(1):75-89. 5. Guerra C, Collado M, Navas C, Schuhmacher AJ, Hernandez-Porras I, Canamero M, et al. Pancreatitis-induced inflammation contributes to pancreatic cancer by inhibiting oncogene-induced senescence. Cancer Cell. 2011;19(6):728-39. 6. Caldwell ME, DeNicola GM, Martins CP, Jacobetz MA, Maitra A, Hruban RH, et al. Cellular features of senescence during the evolution of human and murine ductal pancreatic cancer. Oncogene. 2012;31(12):1599-608. 7. Maldonado JL, Timmerman L, Fridlyand J, Bastian BC. Mechanisms of cell-cycle arrest in Spitz nevi with constitutive activation of the MAP-kinase pathway. Am J Pathol. 2004;164(5):1783-7. 8. Michaloglou C, Vredeveld LC, Mooi WJ, Peeper DS. BRAF(E600) in benign and malignant human tumours. Oncogene. 2008;27(7):877-95. 9. Michaloglou C, Vredeveld LC, Soengas MS, Denoyelle C, Kuilman T, van der Horst CM, et al. BRAFE600-associated senescence-like cell cycle arrest of human naevi. Nature. 2005;436(7051):720-4. 10. Castro P, Giri D, Lamb D, Ittmann M. Cellular senescence in the pathogenesis of benign prostatic hyperplasia. Prostate. 2003;55(1):30-8. 11. Deschenes-Simard X, Gaumont-Leclerc MF, Bourdeau V, Lessard F, Moiseeva O, Forest V, et al. Tumor suppressor activity of the ERK/MAPK pathway by promoting selective protein degradation. Genes Dev. 2013;27(8):900-15. 12. Vernier M, Bourdeau V, Gaumont-Leclerc MF, Moiseeva O, Begin V, Saad F, et al. Regulation of E2Fs and senescence by PML nuclear bodies. Genes Dev. 2011;25(1):41-50. 13. Romanov SR, Kozakiewicz BK, Holst CR, Stampfer MR, Haupt LM, Tlsty TD. Normal human mammary epithelial cells spontaneously escape senescence and acquire genomic changes. Nature. 2001;409(6820):633-7. 14. Deschenes-Simard X, Kottakis F, Meloche S, Ferbeyre G. ERKs in cancer: friends or foes? Cancer Res. 2014;74(2):412-9. 15. Blazejczyk M, Miron M, Nadon R. FlexArray: A statistical data analysis software for gene expression microarrays. Genome Quebec, Montreal, Canada. 2007;http://genomequebec.mcgill.ca/FlexArray. 16. Huang da W, Sherman BT, Lempicki RA. Systematic and integrative analysis of large gene lists using DAVID bioinformatics resources. Nat Protoc. 2009;4(1):44-57. 17. Subramanian A, Tamayo P, Mootha VK, Mukherjee S, Ebert BL, Gillette MA, et al. Gene set enrichment analysis: a knowledge-based approach for interpreting genome-wide expression profiles. Proc Natl Acad Sci U S A. 2005;102(43):15545-50. 18. Gotea V, Ovcharenko I. DiRE: identifying distant regulatory elements of co-expressed genes. Nucleic Acids Res. 2008;36(Web Server issue):W133-9. 19. Tchkonia T, Zhu Y, van Deursen J, Campisi J, Kirkland JL. Cellular senescence and the senescent secretory phenotype: therapeutic opportunities. J Clin Invest. 2013;123(3):966-72. 20. De Heller-Milev M, Huber M, Panizzon R, Hohl D. Expression of small proline rich proteins in neoplastic and inflammatory skin diseases. The British journal of dermatology. 2000;143(4):733-40. 21. Deng Z, Matsuda K, Tanikawa C, Lin J, Furukawa Y, Hamamoto R, et al. Late Cornified Envelope Group I, a novel target of p53, regulates PRMT5 activity. Neoplasia (New York, NY. 2014;16(8):656-64. 22. Fridman AL, Tainsky MA. Critical pathways in cellular senescence and immortalization revealed by gene expression profiling. Oncogene. 2008;27(46):5975-87. 23. Gaumont-Leclerc MF, Mukhopadhyay UK, Goumard S, Ferbeyre G. PEA-15 is inhibited by adenovirus E1A and plays a role in ERK nuclear export and Ras-induced senescence. J Biol Chem. 2004. 24. Bartkova J, Rezaei N, Liontos M, Karakaidos P, Kletsas D, Issaeva N, et al. Oncogene-induced senescence is part of the tumorigenesis barrier imposed by DNA damage checkpoints. Nature. 2006;444(7119):633-7. 25. Acosta JC, O'Loghlen A, Banito A, Guijarro MV, Augert A, Raguz S, et al. Chemokine signaling via the CXCR2 receptor reinforces senescence. Cell. 2008;133(6):1006-18. 26. Collado M, Gil J, Efeyan A, Guerra C, Schuhmacher AJ, Barradas M, et al. Tumour biology: senescence in premalignant tumours. Nature. 2005;436(7051):642. 27. Chicas A, Wang X, Zhang C, McCurrach M, Zhao Z, Mert O, et al. Dissecting the unique role of the retinoblastoma tumor suppressor during cellular senescence. Cancer Cell. 2010;17(4):376-87. 28. Young AR, Narita M, Ferreira M, Kirschner K, Sadaie M, Darot JF, et al. Autophagy mediates the mitotic senescence transition. Genes Dev. 2009;23(7):798-803. 29. Passos JF, Saretzki G, Ahmed S, Nelson G, Richter T, Peters H, et al. Mitochondrial dysfunction accounts for the stochastic heterogeneity in telomere-dependent senescence. PLoS Biol. 2007;5(5):e110. 30. Moiseeva O, Bourdeau V, Roux A, Deschenes-Simard X, Ferbeyre G. Mitochondrial dysfunction contributes to oncogene-induced senescence. Mol Cell Biol. 2009;29(16):4495-507. 31. Blum R, Elkon R, Yaari S, Zundelevich A, Jacob-Hirsch J, Rechavi G, et al. Gene expression signature of human cancer cell lines treated with the ras inhibitor salirasib (S-farnesylthiosalicylic acid). Cancer Res. 2007;67(7):3320-8. 32. Font de Mora J, Porras A, Ahn N, Santos E. Mitogen-activated protein kinase activation is not necessary for, but antagonizes, 3T3-L1 adipocytic differentiation. Mol Cell Biol. 1997;17(10):6068-75. 33. 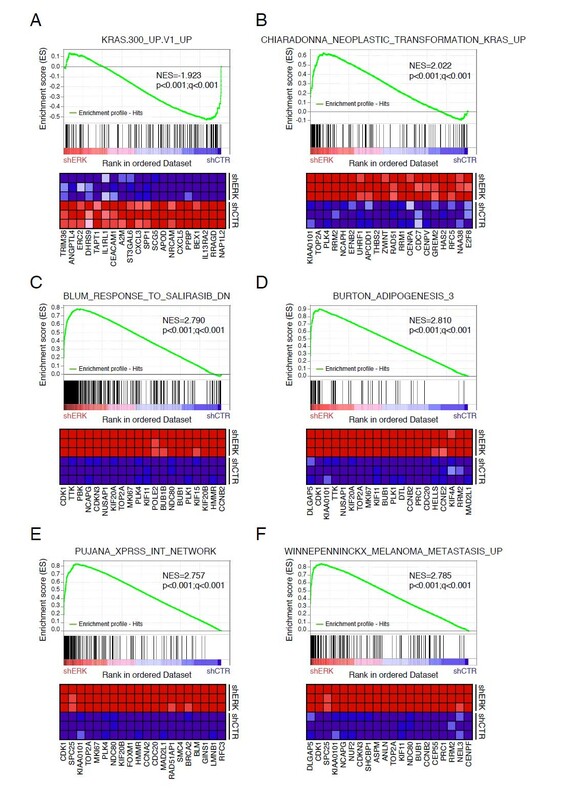 Burton GR, Nagarajan R, Peterson CA, McGehee RE, Jr. Microarray analysis of differentiation-specific gene expression during 3T3-L1 adipogenesis. Gene. 2004;329:167-85. 34.Pujana MA, Han JD, Starita LM, Stevens KN, Tewari M, Ahn JS, et al. Network modeling links breast cancer susceptibility and centrosome dysfunction. Nat Genet. 2007;39(11):1338-49. 35.Sirchia SM, Ramoscelli L, Grati FR, Barbera F, Coradini D, Rossella F, et al. Loss of the inactive X chromosome and replication of the active X in BRCA1-defective and wild-type breast cancer cells. Cancer Res. 2005;65(6):2139-46. 36. Lopez-Bergami P, Huang C, Goydos JS, Yip D, Bar-Eli M, Herlyn M, et al. Rewired ERK-JNK signaling pathways in melanoma. Cancer Cell. 2007;11(5):447-60. 37. Leppa S, Saffrich R, Ansorge W, Bohmann D. Differential regulation of c-Jun by ERK and JNK during PC12 cell differentiation. EMBO J. 1998;17(15):4404-13. 38. Levine AJ, Oren M. The first 30 years of p53: growing ever more complex. Nat Rev Cancer. 2009;9(10):749-58. 39. Moiseeva O, Deschenes-Simard X, St-Germain E, Igelmann S, Huot G, Cadar AE, et al. Metformin inhibits the senescence-associated secretory phenotype by interfering with IKK/NF-kappaB activation. Aging Cell. 2013;12(3):489-98. 40. Juang YL, Jeng YM, Chen CL, Lien HC. PRRX2 as a novel TGF-beta-induced factor enhances invasion and migration in mammary epithelial cell and correlates with poor prognosis in breast cancer. Mol Carcinog. 2016. 41. Stepanenko AA, Andreieva SV, Korets KV, Mykytenko DO, Baklaushev VP, Chekhonin VP, et al. 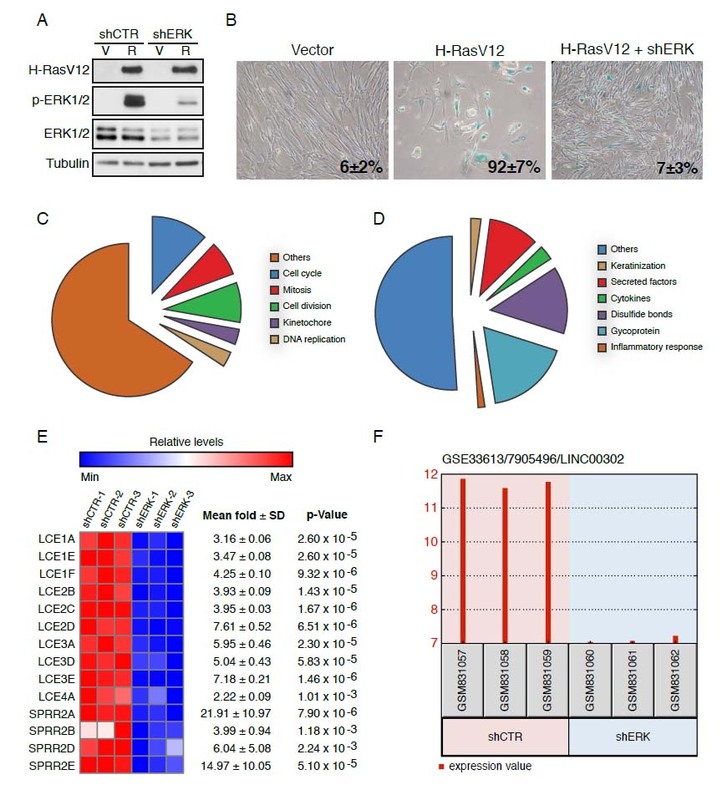 mTOR inhibitor temsirolimus and MEK1/2 inhibitor U0126 promote chromosomal instability and cell type-dependent phenotype changes of glioblastoma cells. Gene. 2016;579(1):58-68. 42. Huang S, Ingber DE. A non-genetic basis for cancer progression and metastasis: self-organizing attractors in cell regulatory networks. Breast Dis. 2006;26:27-54. 43. Waddington CH. Cancer and the theory of organizers. Nature. 1935;135:606-8. 2-Department of Stomatology, Université de Montréal, C.P. 6128, Succ. Centre-Ville, Montréal, Québec, H3C 3J7, Canada.